My meatloaf skills have come a long way, baby. The first time I made meatloaf I created a sweet disaster. I gathered all of the most interesting meatloaf making tips from my mother, mother-in-law, and a couple of aunts-in-law and put them all together in one recipe. I had meatloaf tips galore! Use crushed Saltines; use only crushed Ritz crackers; bread crumbs are the best! Add a honey glaze to the top and brown sugar to the meat mixture. Pour ketchup over it! Mix ketchup and brown sugar in the meatloaf AND on top. Oh my! I added a little of everything that had been suggested to me, stuck the meatloaf in the oven, and crossed my fingers. Y’all. It was not good. It was quite sweet. I may have gotten carried away with the brown sugar suggested by at least two of my meatloaf mentors. My darling husband suffered through and choked it down but I refused to eat more than two bites. It was hands-down the worst dish I have ever made. Eleven years after the “Sweet Meat Fiasco of 2001” I have come a long way with my meatloaf recipe. Most importantly, I’ve learned that crackers, bread crumbs, and sugar are completely unnecessary ingredients for a delicious meatloaf. 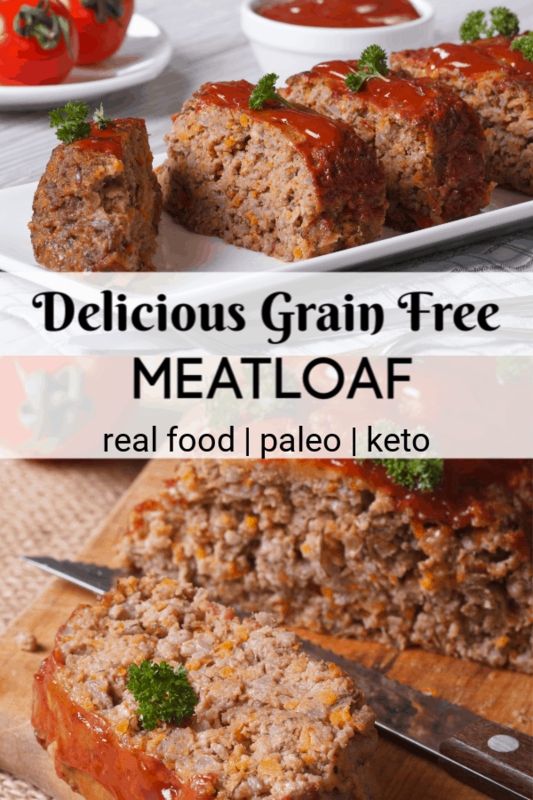 When I transitioned my family from a standard American diet to a paleo diet my meatloaf recipe was among the first recipes I changed to a grain-free one. 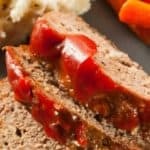 If you’ve visited this page before you’ll notice that I’ve updated my grain-free meatloaf recipe to give low-carb options for a keto meatloaf recipe. I even added cheese as an optional (but recommended) ingredient. My family eats mostly low-carb, high-fat now and I’ve changed our favorite recipes to accommodate our new way of eating. Read on for my grain-free, keto-friendly meatloaf recipe. There’s a printable option at the end if you need it. Perfect Paleo Meatloaf Recipe OR the Best Keto Meatloaf Recipe – You Decide! When my family began our real food journey, I began creating recipes that reduced the amount of wheat and grains we consumed. Although we first tried the Weston A. Price /Nourishing Traditions diet, we soon realized that a Paleo /Primal diet worked better for our family. It’s time consuming to properly prepare grains and we all feel better when we eat fewer grains. We prefer to consume wheat in yummier forms like pancakes, waffles or sourdough bread when we do eat it. I struggled to find a good meatloaf recipe without bread crumbs or crackers in the mix, so I created one. I’d heard that meatloaf would fall apart after baking if there were no breadcrumbs in the recipe but, to my delight, my grain free meatloaf didn’t fall apart. Also, I omitted all of that brown-sugar business that I’d been told was crucial for a yummy meatloaf. It’s not. If it was, however, I would have use coconut sugar instead of brown sugar. My original recipe (which you can see below in addition to the keto updates I’ve made to it) uses honey in the glaze, but I’ve found the recipe to be delicious without it, as well. If you want a completely unsweetened keto meatloaf use an unsweetened ketchup instead of the tomato paste/honey glaze. And, of course, you can use a ketchup sweetened with stevia, erythritol, or sucralose if you prefer. I don’t use no-calorie sweeteners because they all taste terrible to me and do terrible things to my digestive system. Yes, even stevia. Yuck! The glaze is optional, but I like it because it makes the meatloaf feel and taste more like “mom’s classic meatloaf”. Add the minced garlic to the skillet and saute for a few minutes. Don’t burn the garlic! FOR PALEO GLAZE – While the garlic and onions saute, prepare the glaze by combining the glaze ingredients in a saucepan over medium-low heat and stir to combine. When sauce is hot and combined remove from heat and set aside. Place the ground beef, eggs, sauteed onion and garlic, onion powder, garlic powder, paprika, nutmeg, salt, pepper, and (optional) ground mustard and cheddar cheese in a large mixing bowl and mix by hand until well combined. Form a loaf and place in the prepared loaf dish. If you’re using a glaze, spread it over the meatloaf now. Let the meatloaf sit for at least 10 minutes after removing from the oven. The glaze is optional, but I like it because it makes the meatloaf feel and taste more like "mom's classic meatloaf". Add the minced garlic to the skillet and saute for a few minutes. Don't burn the garlic! FOR PALEO GLAZE - While the garlic and onions saute, prepare the glaze by combining the glaze ingredients in a saucepan over medium-low heat and stir to combine. When sauce is hot and combined remove from heat and set aside. If you're using a glaze, spread it over the meatloaf now. 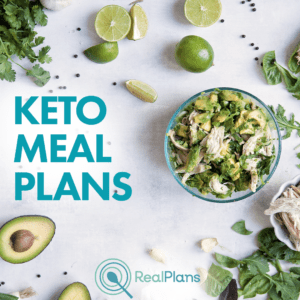 If you’re looking for Keto Meal Plans I recommend REAL PLANS. They’re my favorite real food, keto meal planner.